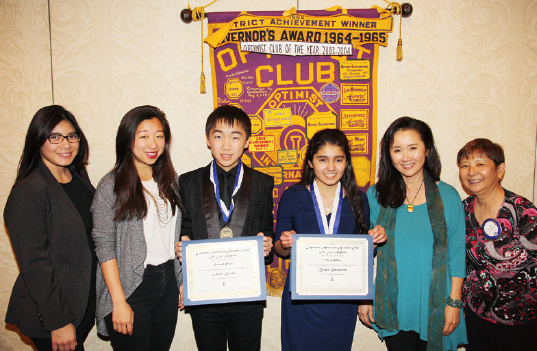 JAO honored essay contest winners at their meeting on Jan 27. From left: Tori Leon, Kelly Osajima, Jason Kwan, Breeze Hernandez, Teresa Watanabe, Eileen Yoshimura. First place winner Alexander Nakagawa was unable to attend. Alexander Nakagawa, a South Pasadena High senior, won top honors in the Japanese American Optimist Club’s annual essay contest, with a reflection on lessons in leadership he learned from the example of John Wooden, the legendary UCLA basketball coach. Breeze Hernandez, a Los Altos sophomore, wrote about the leadership demonstrated by such role models as abolitionist and feminist Elizabeth Cady Stanton, education rights activist Malala Yousafzai, and her mother, a single parent who raised her family despite punishing physical disabilities. Nakagawa, the son of Roy and Mikako Nakagawa, is also a Boy Scouts of America Eagle candidate, school Coding Club member, and captain of the boys varsity basketball and volleyball teams. He hopes to major in computer science or network engineering. As winner at the club level, Nakagawa will advance to the Pacific Southeast District contest for a chance to win a $2,500 college scholarship. Essay contest judges were Samantha Masunaga of The Los Angeles Times, Gwen Muranaka of The Rafu Shimpo, and Kelly Osajima, a 2016 fellow of the New Leaders Council.